To amend a famous phrase: “Nothing can be said to be certain, except death, taxes…and pathogens.” That is right. These tenacious little trouble makers are constantly knocking at our doors in the food industry. It is hard not to resent their tenacity and the ill effects they bring with them on a daily basis. However, there is hope! Get ready to give our microscopic mischief makers the boot! A new tool in the fight against pathogens called the “HACCP Defender Boot Sanitizing System” will have your employees lining up to focus on this very issue. 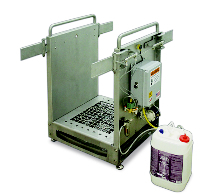 The HACCP Defender is a walk-in station that utilizes the proven power of Alpet D2 Surface Sanitizer to thoroughly treat employees’ boots before they walk into critical areas of your operation. The HAACP Defender uses infrared sensors to operate control doors and sprayers, that combined are designed to ensure boots get a thorough application of ALPET D2. Featuring stainless steel construction, the walk-in design reduces chemical waste and controls moisture, ensuring a safe and easy way to combat the threat of pathogens on a daily basis. To check out more information and view the HACCP Defender in action click here, or contact Devon Jones, MRO Product Manager, at 800-826-8302 to discuss how the HACCP Defender can help your operation kick pathogens out of daily operations from your food industry operation.